The charming small town of Tomar, Portugal, famous for its Knights Templar past, Tomar Castle and the Convento de Cristo, is located in Central Portugal, just 90 minutes northeast of Lisbon or two hours southeast of Oporto. It was founded in the 12th century by the Knights Templar on land granted by the first king of Portugal, King Afonso Henriques. Tomar was the last ever Templar town to be commissioned. 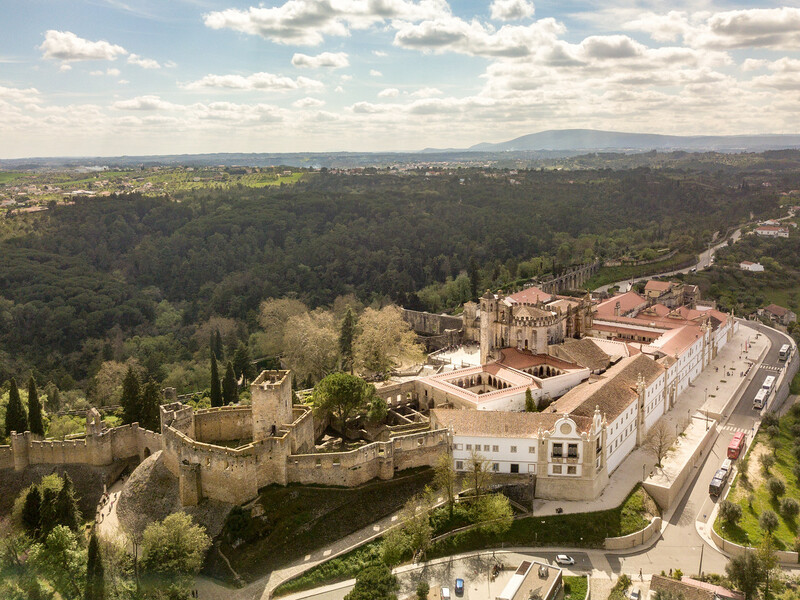 The transformed Order of Christ eventually took over Tomar Castle and Convento de Cristo from the Knights Templar, and Tomar, under the rule of Henry the Navigator became the city where the many Portuguese voyages in the Age of Discovery were organized. But enough of the history, what are the best things to see and do in Tomar. 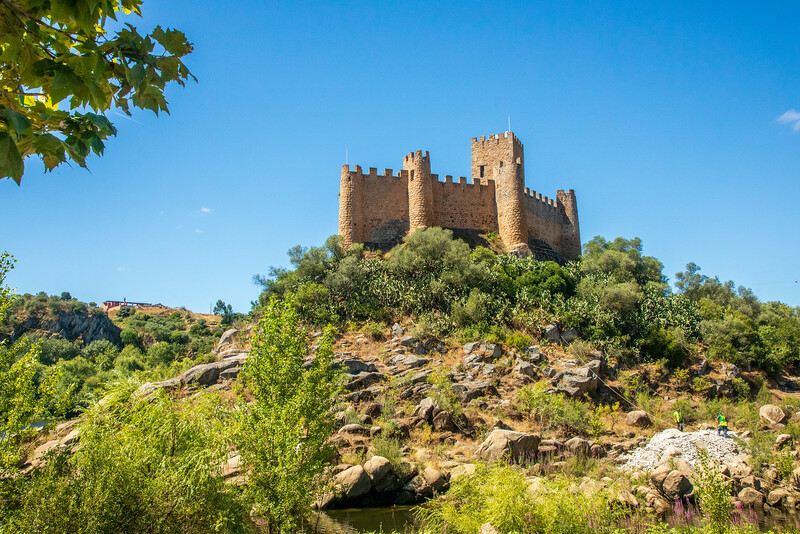 Tomar Castle was built by the Knights Templar in the middle of the 12th century, in a strategic hill-top position overlooking the River Nabão. It’s an excellent example of Templar architecture and now a UNESCO World Heritage Site. It’s free to enter and wander around the grounds of Tomar Castle. 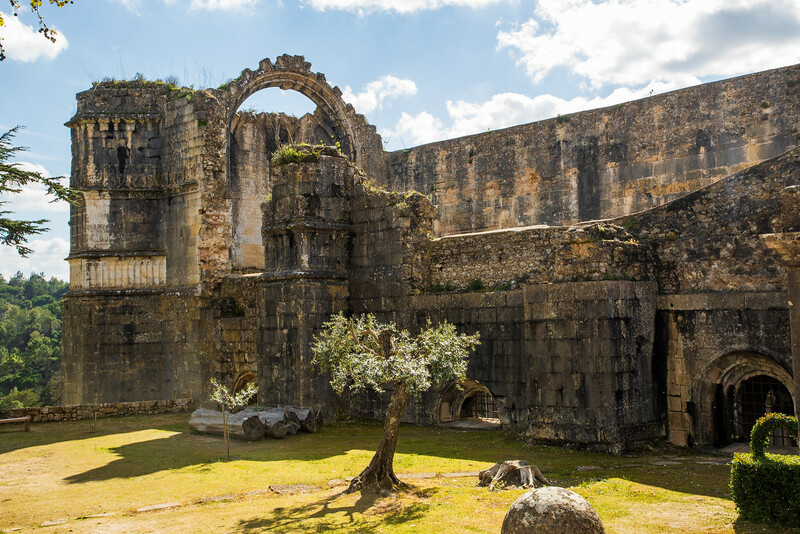 Within the castle grounds, you’ll find the renowned Convento de Cristo. 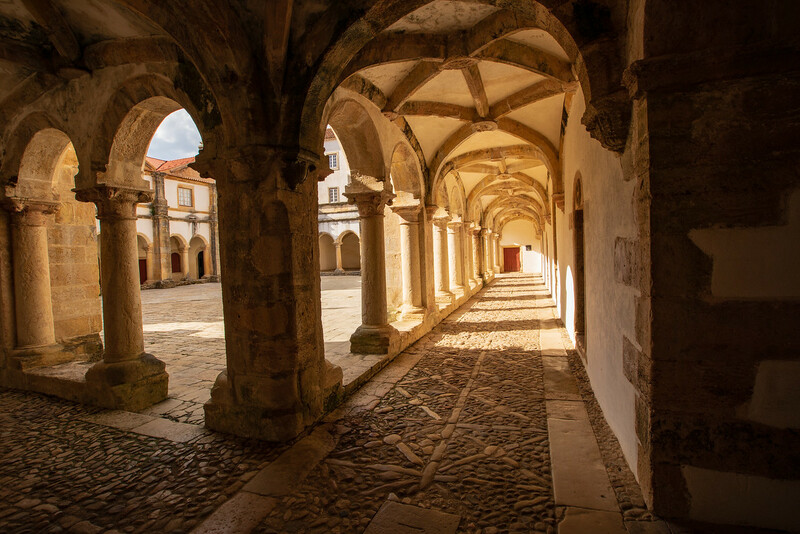 No trip to Tomar, Portugal would be complete without a visit to the Convento de Cristo. It’s a short but steep walk uphill from the old city, although it is possible to drive up to the top or take one of the tuk-tuk tours from the main square in the old town. The convent is an astonishing mix of architectural styles – Gothic, Moorish, Manueline. Be sure not to miss the incredible Manueline ‘Janela’ or window. The narrow cobbled streets of the old town are filled with cafes, family-run restaurants, and cute shops. We found a lovely local restaurant and tucked into a huge bowl of Arroz de Tamboril (monkfish rice) for just five euros each. The tourist office in Tomar provides a self-guided walking map to assist you with exploring the town and riverside park. 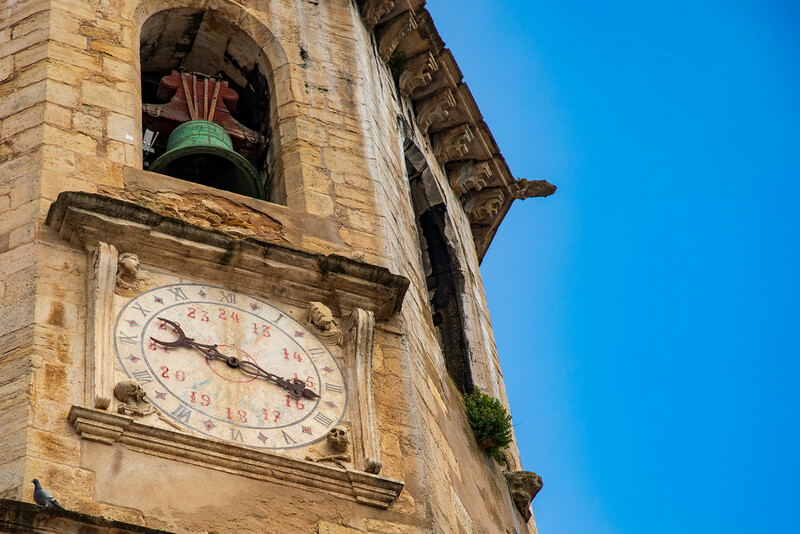 This 15th-century church lies in the heart of the old town in the main square and is also an excellent example of Manueline architecture which was introduced to Portugal around this time. It has a really cool clock that once belonged up in the castle. The church is free to enter and open to visitors daily from 08.00 to 19.00 throughout the year. The main square, the Praça da República is located just in front of the church. Here you will get a great view of Tomar Castle up on the hill. The square has many coffee shops, a beautiful 16th century Town Hall and a statue of Gualdim Pais, a Templar Knight and founder of Tomar. 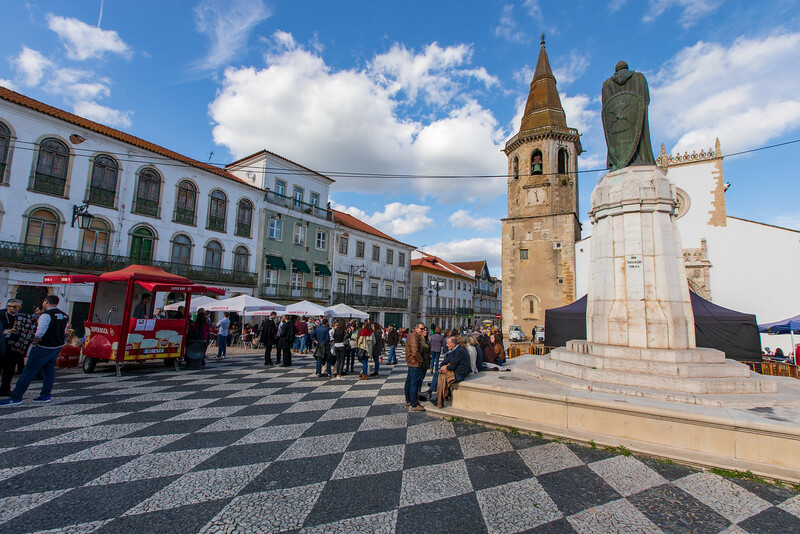 It is in this square that the Festa dos Tabuleiros (Festival of Trays) is held. The festival is one of the most important festivals in Portugal and takes place every four years. The next time will be 2019, but we were fortunate to witness a mini-rehearsal, while we were in Tomar. 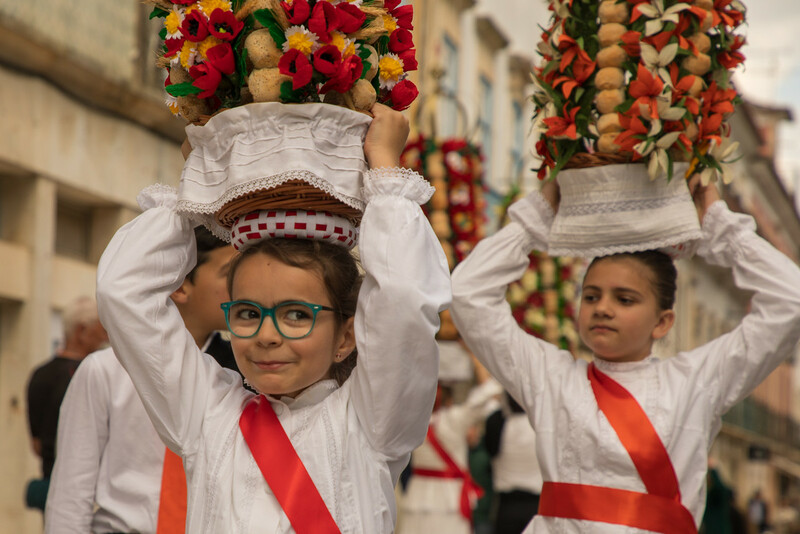 The tabuleiro is made of 30 pieces of bread and decorated with flowers and carried on the head. This festival dates back to the 1200’s. Just a short drive from Tomar is an impressive looking aqueduct. 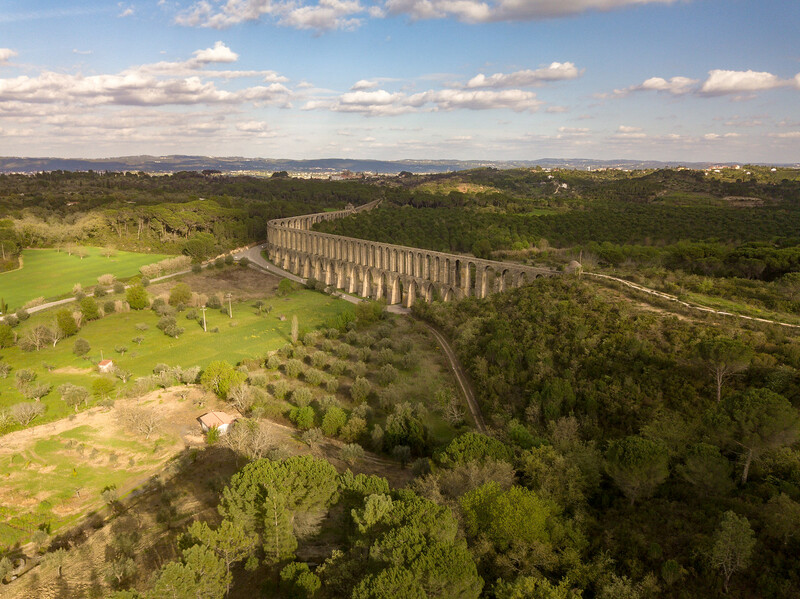 This six-kilometer aqueduct was built by the Convent of the Order of Christ in the early 16th century to bring water from the springs in Pegões. If you’re brave enough, we weren’t, you can walk along the aqueduct at the top. Just a half hour drive from the city of Tomar, Portugal is the Castle of Almourol. The Castle of Almourol is considered to be the most beautiful castle of Portugal. It’s positioned on a small island in the middle of the River Tagus. There is evidence that the original fort here was Roman, but the Knights Templar of Portugal rebuilt the castle and made it their own during the 12th century. The main door of the castle shows the date 1171. When the Knights Templar were no longer in power, the castle was abandoned and left to fall into ruins, but was restored during the 19th century. The entrance is free but you have to pay €2,50 for a boat ride to the entrance. Parking is free. Castle of Almourol is Open daily. Note for photographers: the castle is located close to a military base so cannot use drone cameras. 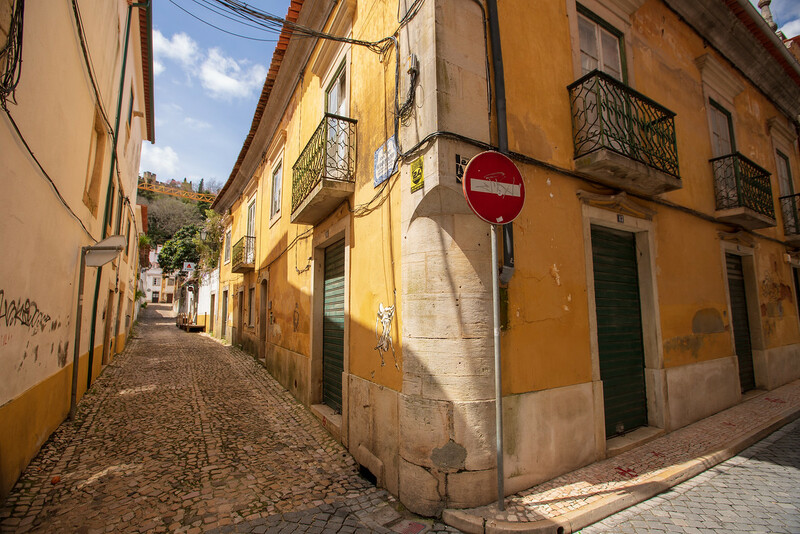 By car – Tomar, Portugal is just 135 kilometers from Lisbon or 190 kilometers from Oporto. By bus – check with www.rede-expressos.pt. Tomar is quite a small city, so once there, it’s easy to see most of the major sites on foot. If you are walking the Camino Portugues, just follow the yellow arrows from Lisbon. Superb writing and photos as always you guys !! Really enjoyed reading this and of course the last pic is a tribute to my love of civil engineering – thanks for posting that one ! Thanks Ben! I am a bit of an aqueduct freak myself.